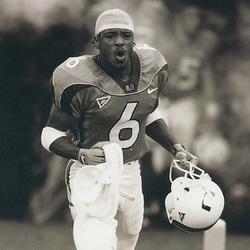 Santana Moss is considered one of the Miami football programs most explosive and exciting players in its storied history. The Miami native, who won 2 state titles in the long jump and one in the triple jump while at Carol City High School, brought his game breaking speed and big play capabilities to Coral Gables and rewrote the Hurricanes record books. He is the school career leader in all-purpose yards (4,402 yards), receiving yards (2,546), punt return yards (1,196) and career punts returned for touchdowns (6). He set an NCAA record in 2000 with 4 punt returns for touchdowns on the year. That year, he also set the school single season record for punt return yards (655). He led Miami in receptions and receiving yards in 1999 (54 for 899 yards), and in receptions in 2000 (45), and is tied with Michael Irvin for third in most career pass receptions with 143 catches. He also tied a school record with 3 pass receptions for touchdowns against Rutgers in 1998. Santana was named the 2000 BIG EAST Offensive AND Special Teams Players of the Year, the only player in league history to win both awards. He was named First team All BIG EAST in 1999 and 2000 (unanimous choice), and 2nd team in 1998. In 1999, he was named a Biletnikoff Award semi-finalist and in his senior season , he finished 7th in the Heisman Trophy balloting. He put his lightning speed to use with the Hurricanes track team and, in 1999, set a school record in the 60 meter indoor (6.72), a record that stood for 11 years. That same year, he was a member of the conference champion 4x100 meter team. In 2000, Santana was named the BIG EAST Most Outstanding Field performer when he won the conference title in both the long jump and triple jump. He was drafted in the 1st round (16th overall) of the 2001 NFL draft by the New York Jets, and just completed his 10th professional season, currently with the Washington Redskins, he is a 2 time Pro Bowl selection. Santana graduated with a Bachelor of Liberal Arts (BLA '01) degree and is married to his high school sweetheart, LaTosha; they have three children.